Because I live in Norco, California-- officially christened with the motto, "Horsetown, USA"-- the BLM figures they can find lots of horse lovers with horse property just waiting to adopt a mustang and stick it in their backyard. Uhm, not so much anymore. Mustang adoptions here and throughout the country are far below the levels of past years. The main reason? Just take a look at the online and print ads offering horses for sale. Many people simply cannot afford the domesticated, broke to ride horses they have now. Adding another horse-- especially one requiring more care and more attention-- to the family herd is not feasible. Not only is the economy shaky, but feed costs are escalating. The high price of alfalfa, for example, was just one reason why several of the attendees at this particular BLM adoption were literally laughing at the informational brochure being distributed. The BLM estimated the cost of feeding a horse to be "about $1,000 a year" depending on "the region" where you lived. I can tell you that would not be in the region of California, where this adoption event was being held. With hay selling regularly for $18-$20 a bale, the annual cost for feeding a horse is at least double the stated amount. And then there's the training issue. I know that some of the regular readers of this blog have adopted BLM mustangs and are making great progress. A good friend of mine rides her mustang on the trails with me. And I'm aware that Wells Fargo (a large banking institution in the West) uses bay mustangs to pull their trademark stagecoach. And the U.S. Marines color guard uses palomino mustangs in parades and drills. Yet all of these successful mustang scenarios have one thing in common: The adoptee possessed a certain level of horsemanship skills. Trust me, at the BLM event that I attended, many of the potential adoptees did not. In fact, it was somewhat frightening how very little some of them knew about feral horses. Some came because this was the only way they could afford a horse: At $125, they could just forego their Starbucks runs for a month and justify the purchase. Others wanted to "save" a wild horse from... what? It's not like the mustangs that roam the California high desert are in danger of being eaten by timber wolves. As I roamed the backside of the holding pens I encountered some interesting tales. One barn manager was told over the phone that a newly adopted mustang wouldn't just back out of the stock trailer and waltz into the corral at its new home. Instead, according to the BLM agent, the driver of the stock trailer would have to back right up to the open gate of the corral, sort of like the space shuttle docking with the space station, and then the driver would open up the back of the trailer and they'd all have to "shoo" the mustang into its new corral. Then this question was posed: "But can we rope it to catch it?" The quick, flat response from the BLM rep was, "No. You cannot rope these horses." Later I struck up a conversation with a gentleman who was helping his young daughter select a mustang. Ever since she'd read the book "Cloud" her dream was to own a wild horse. When I pointed out the fractious behavior of the mustangs that were currently being shooed through the chutes into an adjoining pen, their ears pinned, their tails tucked between their hind legs, and their hooves clanking against the metal rails, I could see the wheels turning in the dad's head: So, like, how do my 10-year-old daughter and I get a halter on such an animal so we can groom it and fuss with it and make it tame so it loves us? You're probably wondering where I'm headed with this diatribe. It's this: I not convinced that the mustangs' welfare is always put first. Otherwise, the BLM would be more concerned about screening potential homes than just checking off one more mustang from the burgeoning herd of horses warehoused on what amounts to government feedlots. I mentioned to the BLM spokesman who was overseeing this event that some of the attendees seemed ill prepared to handle or gentle a mustang. He said (in so many words) that it wasn't the BLM's problem. He motioned to a poster that listed a handful of requirements for adopting a mustang. They included a 20 x 20 corral with a 3-sided shelter. Nothing about prior experience handling a green or untamed horse or basic horse care skills. No proof required to demonstrate that an adoptee knew how much to feed a horse or when to summon a vet. As long as there wasn't any intentional neglect or outright abuse, the BLM was content to let the mustangs go to anyone who ponied up the small amount of cash and signed a form. "Is that good enough?" I asked. "Should some of these people, perhaps, not be adopting a mustang right now?" "There are people who shouldn't have kids who have kids," he said. "But this is America. We don't stop them." So there may be some people who, for various reasons, probably shouldn't be saddling themselves with the welfare and training of a mustang. But no one, apparently, is going to talk them out of it. At least no one from the BLM. Somehow, I think the mustangs deserve more. Because of my job as a contributing editor to Horse Illustrated, I've participated in quite a few photo shoots. Many times over the years I've been asked to model trendy riding apparel which gave me a front row seat to what was going to be the next Big Thing in equestrian fashion. Though I don't do it much any more, I have also served as a demonstrator, where I read through the manuscript of a training article as if I'm reading a script. And then I have to hop on a horse and execute the exercise precisely as it should be done in a perfect world. That can be a little stressful, because I have to ride in front of my editor who wants the perfect shot, and also in front of a professional photographer who wants the same thing. Being a demonstrator model gives me a sense of what it's like to shoot a movie. It's almost as if I can hear a director saying, "Cut! Come on, Cindy, do it again, but now try not to grimace when you're cantering the horse over that jump without your irons for the seventeenth time!" Fortunately, you only see the successful shots online at Horse Channel or in the pages of Horse Illustrated . You aren't treated to the so-called outtakes where things go slightly awry: the arena becomes too dusty; a horse flicks an ear back at the wrong instant; either horse or rider can't get in the groove to perform; or the weather suddenly changes, ruining the lighting. A great professional equine photographer can minimize the number of outtakes thanks to their talent, training and experience. That's a good thing, because once a horse becomes bored with repeating the same shot over and over again, no one is going to have fun. Wally, for example, has modeled all sorts of tack-- both English and western-- for magazine articles and books because he's photogenic and has conformation that suits both disciplines. He'll strike a pose as long as someone just out of the shot is dangling a carrot or a plastic bag of peppermints in front of his nose. But even Wally catches on after a while. You know Wally is bored when he exhales a big, heavy breath that oozes, "Oh brother, can we get this over with?" I hope you find them to be a visual treat, just as I did! You can always email me at: hc-editor@bowtieinc.com or share your thoughts by clicking on "comments" below. Since I know that horses are always maiming themselves, I keep some money stashed away just for equine emergencies. My little nest egg was plumper than usual because I'd gotten a check in the mail that I hadn't expected. It was for an article I'd written a while back for a (non-horsey) magazine. "Oh joy!" I'd thought to myself, "now I can splurge and buy that fancy straw hat I want for trail riding!" I'd even picked out the silver-studded hatband and the braided horsehair stampede string. And then I noticed that Wally's eyes were "goopey." I know that's not a technical term that vets use, but we all know what that means: The late summer onslaught of dust and flies were beginning to irritate his eyes, even though I consider Wally's living quarters immaculate and he's doused daily in fly repellent. He even has a new fly mask. By Friday evening, however, he'd been rubbing his itchy left eye despite my attempts to wash out dust and goop with sterile saline. That's also when I noticed that he had an itty bitty teensy white fleck near the outer edge of his iris, the colored part of his eye. Knowing that corneal ulcers can, in the worst case scenarios, result in awful infections that can ultimately lead to a loss of sight or a loss of the eye itself, I called my vet, Jennifer. I was treated to this long voice mail message that concluded with the announcement that Jennifer was in Hawaii. Are you noticing a trend here, where it seems like my horsey friends are forever trotting off to Hawaii? I'm certainly aware of it! I ended up with the vet assigned to take Jennifer's calls. I won't go into the emotionally tinged details, but let's just say that Wally was not a very cooperative patient. And that's precisely what I had predicted, although this vet, who was unacquainted with The Beast That Lurks Within Walter, apparently hadn't believed how bad my horse could be until Wally had dragged both her and me out of the stable area, through the car port and onto my patio. Yes sir, that's what Wally will do: threaten to commit suicide just to make a point. When all of us had called a truce, I was given some ointment to put in his eye. I also was given two syringes of serum (made from fresh equine blood) to flush into his affected eye several times a day. That's one of the newest treatments for aiding the healing of injured equine eyes. Who knew? Not me. Plus Wally got some oral Banamine paste to help reduce inflammation and pain. This is all well and good except that Wally was now completely sure that no one-- including me-- was going to get anywhere near his sore eye. Ever. Again. But I have my own Ways with Wally. Since he was a western pleasure show horse for several years, he's used to having someone fuss with his face: combing his forelock, brushing his blaze, wiping his pink muzzle and applying baby oil around his eyes. So that's what I did, along with shoveling peppermints and horse cookies down his throat. You know, the old "spoonful of sugar helps the medicine go down" thing. When he least expected it, I slipped the tip of the tube of ointment or the rubber nose of the little syringe full of serum underneath the rub rag and then squeezed the magical elixirs into his eye. Before he could protest I shoved another goodie into his mouth. Today his eyes are no longer red or goopey, and the fleck of white is nearly gone. These are all good signs and I'm thinking that Wally, despite his aversion to veterinary care, is on the mend. Now, if I can only come across another check that I wasn't expecting, I can replenish my bank account for the next time Wally needs a doctor's appointment. That's the way it is with horses: You get a little money ahead, and then they figure out a way to make you spend it. That's probably why I'll never get to Hawaii. If you have any remarks or tales you'd like to share, just click on "comments" below! Yesterday my doctor stripped me of my fanny pack and its contents. He also pulled out the temporary lead from where it was sutured under the skin of my upper back. It was transmitting an electrical impulse from a battery to the muscles surrounding my shoulder blade, in an effort to control the pain I still have. I was pleasantly surprised that this removal process didn't hurt, but then maybe I was just thankful to have a mummy's worth of tape and gauze off my back. So the verdict is... I'm going to have the permanent lead "hitched up" to the battery that's implanted in my right side of my, uhm, fanny. (There's that word again). As you can imagine, when that's done I won't be able to ride, let alone walk sprightly, for a while. But it's worth the trouble, as it means that I will be using less oral pain medicine, which will then make riding and taking care of Wally that much easier. Honestly, I am keeping this ordeal all in perspective. When I'm in my doctor's office (he's a pain medicine specialist), I'm usually surrounded by patients who are, in my estimation, far worse off than me. Some are wheelchair-bound with their breathing dependent on a ventilator. Others are crippled over with back pain or advanced arthritis. Some are trauma victims still healing from their wounds, bound in bandages. They almost make me feel guilty, because why we all live in our own hell, surely some of us suffer more than others. I, at least, for all of the problems I've endured, can find daily comfort in the most wonderful of companions, my horse. When I bought Wally I never knew he would end up being my best buddy. He was sullen, hated his job as a show horse, and delighted in figuring out how to take advantage of any human stupid enough to try to associate with him. Over time, he has become a lovely horse to ride, a character (of the best sort) to handle and a four-legged soulmate. Regardless of how I feel, I can climb aboard Wally, turn him down the trail and forget whatever is ailing me. He jogs his little pitty-pat trot and I'm a cowgirl moseying after a herd of wayward calves. I nudge him into his rocking chair lope and I'm on the lookout for bandits. We gallop and I'm the sole female rider for the Pony Express. When I ride him down the trail that borders the main street in town, where the cars cruise past and people shuffle in and out of store fronts, I feel like the luckiest gal in the world, astride my flashy Paint gelding. If I could bottle how I feel when I'm riding, I'd pass it out to all the patients in my doctor's office and whisper, "Here. Take a swig of this. I guarantee you'll feel better." That's what I like best about being a horse lover: My horse can transport me to a time and place where my heart sings. Share the Bestest Thing Ever About Being a Horse Lover. After reading it, you can leave your comments there, where it says, "Submit a Comment." In the meantime, I'll be scrubbing tape residue off my back. "Why is the Judge Scratching Her Back All the Time?" I had my workmate in the judge's booth-- the cute, clever young gal who served as the announcer-- snap this photo of me. Before you gasp and faint at my casual attire, let me assure you that no, this is not my usual style of dress while I'm judging a horse show. But then, what DOES go well with personalized medical equipment? And which accessories complement a hefty fanny pack? My answer? 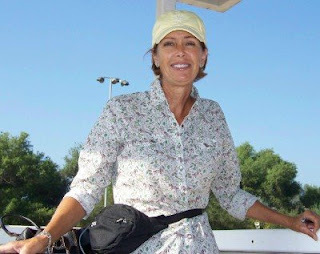 Clothe myself in a baggy horse blouse, stick a ball cap on my head and call it good. 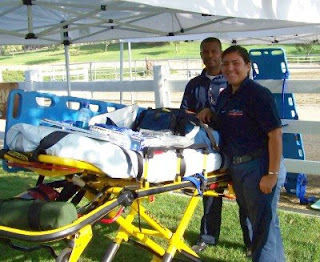 And just so that I'd feel at home the show manager gestured over to the other arena and pointed out that the EMTs were stationed within earshot of me, just in case I should feel the need for yet more medical attention. Very funny. As I'd predicted, the weather was quite warm, but the facility was lovely. It has an abundance of grass and leafy shade trees, and I got to sit in a comfy judge's booth, so I didn't suffer. The kids I judged were all properly mounted on reliable horses, and it was nice to observe that, for the most part, they all had consistent coaching and preparation before they went into the show arena. Anything that helps prevent accidents, and bolsters a rider's chances for success, makes my job as a judge all the more pleasant... even if I'm not exactly feeling pleasant. I survived Wednesday's surgical procedure to do a trial of a new lead for my already implanted nerve stimulator device thingy. (See how scientific I've become!). My doctor is experimenting to see if an additional lead will reduce the pain I still have around my shoulder blade. This is all related to that jumping accident I had almost 3 years ago. Or was it yesterday? Or in another lifetime? Quite honestly, it's all a blur. But, being horse crazy and thereby certifiably insane, I saddled up and rode Wally today. My only concern was the fanny pack I'm forced to wear. I didn't want it flopping against the cantle of my western saddle. It's loaded with cell phone-sized gizmos. They're all attached to each other and then to me, via gray cables. I literally cannot "unplug" myself from this fanny pack and its contents. Needless to say, that fanny pack was cinched tightly around my waist while Wally and I were loping around the arena. Riding did make me feel better. It was a relief to be back in the saddle, even if I'd only been out of the saddle for a day. Truly, there are not many things more traumatic than going into a hospital for surgery, at least not from my point of view. That wall of medicinal odors-- sterile and plastic, so different from manure and sweet hay-- sets off all sorts of alarm bells in my subconscious. I'm not sure how I hold it together, but I do. Perhaps it's because I've tolerated a series of major health problems and multiple surgeries over the last couple of decades. I'm sort of battlefield tested. Yet I still dread that horrible wait from the time the nurse gets the IV line started and the time that I'm actually wheeled into the operating room. It sort of reminds me of entering some high stakes jumping class at a horse show: My adrenaline is racing through my system, I'm psyched up, I'm mentally prepared.... And then the judge takes a potty break or the arena needs to be watered. Everything comes to a grinding halt so that I end up standing at the backgate under a tree, holding the reins of my horse, wondering just how much longer I can tolerate my feet swelling inside my boots before I run screaming from the showgrounds. Yup, that about explains how I felt when I got to the hospital at 2:00 (as directed) but I didn't actually go into the operating room until 6:30. You know you've spent a long time in the pre-op area when the shift change occurs at the nursing station and the staff begins talking about being paid overtime because of, "that last woman back there in Bay #2." Too much longer and I was going to bolt from the gurney and gallop out to the parking lot. But I'm home now with Wally, and that's all that matters. I didn't ride the most reliable horses when I was growing up. My first horse, an over-sized, scruffy pony named "Honeybee" was a half-broke, ill-mannered sorrel beast. Of course, I loved her. But she dumped me more times than I can remember and was the cause of several concussions and a couple of broken bones. Honeybee was followed by a series of spooky, temperamental, rank and reluctant hunters and jumpers: Bubbles, Sweetie, Casper, Great Pumpkin, Sunny, Emily, Syracuse. I say their names aloud and each of their misbehaviors leap to mind with a pounce and a buck. Sure, they taught me how to ride. But it was a bumpy road to experience. The rambunctious bunch I rode as a kid and as a teenager made me appreciate a school horse like Cassie even more. She was not a beautiful horse. She was polka-dotted with red freckles and criss-crossed with splashes of white and roan as if she couldn't decide which Appaloosa coat pattern to adopt as her own. Her mane was strawberry blond and her tail (a thick one by Appy standards) was perpetually kinked. When she was frisky, she'd hold it straight out behind her, like a broom. But she had the purest of hearts. As a school horse, she taught countless kids to ride over the years. In her heyday, she packed little kids around the short stirrup courses at A-rated shows like Indio. She was a show division champion more than once, an odd fit for a bespeckled Appy, although once you saw her jump in fine form and nail every flying lead change, you understood why she raked in the blue ribbons. That's when I first got to know Cassie. She had been given to Sue by a former client, so when my sister and I began riding with Sue at horse shows, hiring her to serve as our coach in the warm-up rings, we'd see Cassie there. She was usually packing some novice kid or timid adult amateur around the low hunter courses, doing honorable duty for anyone in Sue's barn lacking their own show horse. Then, by the time I started giving lessons part-time at Sue's, Cassie had semi-retired and taken on the role of School Horse Extraordinaire. When I conducted my summertime horse camps, Cassie was the one horse I could entrust with every little girl who was utterly horse crazy yet utterly clueless about horses. Though she stood a hefty 15.3-hands, Cassie wouldn't hurt anyone. While she'd jump virtually any fence with gusto, she'd then stand in the crossties and allow kindergartners to decorate her with poster paint, feathers and glitter in a "Dress Up the Horse" contest. It's hard to watch such a horse grow old. In the last year, Cassie began to show her age. Her arthritis made her too stiff to jump anymore. Eventually she began to have trouble lying down and getting up. One night she injured herself scrambling to her feet, and in a testament to Sue's devotion to the mare, lengthy veterinary care brought her back to soundness. Yet when Cassie went down again last weekend, I knew it was time for Cassie to go to that place where great horses go. And so, at the age of 25 (perhaps a year or two more), Cassie was put down. I know that my lesson girls will shed a few tears. Before, when Cassie was being rehabilitated, they'd ask me, "Is Cassie going to get better?" "We'll wait and see," I'd say. And then I'd prepare them for the inevitable, "But Cassie is an old lady..."
This next weekend, when they arrive for their lessons and see that her stall is empty, they will know the answer to Cassie's fate. Sometimes my friends and I will make off-handed comments that this horse or that, recently deceased, "Went to the Emerald Field." But you know what? I'm not so sure that such an emerald field-- a meadow rich with grass, rimmed by shade trees-- doesn't exist, somewhere, for the horses that have blessed our lives. They deserve as much. Cassie certainly does. I have discovered that my enthusiasm for the Olympics has dissipated over the past 4 years since the previous Games. I'm sure it's because I am no longer a dedicated, cut-throat competitor in my own little non-Olympic world of horse shows. When I was competiting on the horse show circuit, I'd sit glued to the TV, watching every medal fest offered during the Olympics. I didn't care whether it was diving, track and field, fencing or beach volleyball. I was thoroughly caught up in the "go for the gold" mindset of each of the participants. Now? Not so much. My spark of empathy has dimmed. In years past, I identified with the athlete who had to eek out a victory over their closest rival, who struggled to maintain their cool under intense pressure. Oh. And let's not forget those, "Dang, I missed it by this much," moments. I've been there, experienced that, too, in horse shows, so I was crushed and crestfallen right along with them. With this Olympic Games, I'm more likely to prick up my ears only for the major contests. For example, like most viewers, I'm fascinated with gymnastics, though I haven't been capable of executing so much as a cartwheel since sixth grade. And I admit that my secret pleasure is any and all of the male swimming contests. Let's just say the scenery is nice. (Hey, I'm only human). Then naturally I want to stay on top of the equestrian events. But otherwise I'm lacking any sort of empathetic, long-distance connections to athletes competiting for medals in things like pole vaulting, synchronized swimming and archery. They simply aren't spiking my Olympic fever anymore. Though Horse Channel won't be providing updates on any other Olympic medal competitions-- you'll have to locate the results for kayaking and the shotput elsewhere-- at least you can stay up to date with what's going on with the world's top horses and riders. And isn't that what always makes our temperatures rise? It's simply not decent riding weather. Period. It's too danged hot and, on top of that, there's some kind of tropical depression (thank you, Mexico) affecting our region, so each time I walk outside I'm reminded of my one and only visit to Puerta Vallarta. I believe I wore shorts and a bikini bathing suit top the entire trip, because I really couldn't tell the difference between being wet due to hopping in the ocean, and wet due to an outpouring of sweat. By the way, a bikini top and shorts aren't really appropriate riding apparel. And don't ask me how I learned this many, many years ago. While I did ride Topper, my sister's horse, at the proverbial crack o' dawn this morning, I am not planning on riding Wally. I keep tossing him cold carrots out of the refrigerator like they're popsicles, though, and he's inside his covered pen, so he's not suffering. This lack of riding today led me to invent ways to spend my time, kind of like a rainy day at the barn. Only I have to remain huddled indoors with the air conditioner on. 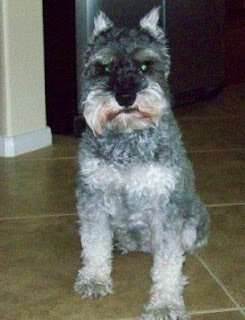 As you can see by the photos below, I became inspired to attack my schnauzer, Betsy, with my set of horse clippers. I figured, what the heck: How much different can it be from clipping a horse? 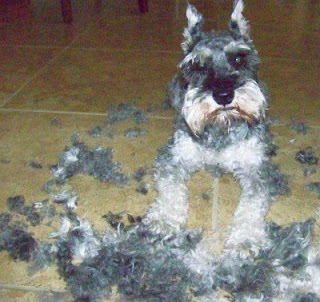 Besides, clipping Betsy myself will save me $55 that would've gone to paying the dog groomer. And that's at least two bales of orchard grass hay for Wally! (See how everything is accounted for in bales of hay these days? It's the new currency for horse owners). Here is Betsy BEFORE I began wielding my horse clippers like a madwoman. Notice how naively she sits on my kitchen floor, totally trusting in my expertise. And here she is about 10 minutes later. I have no idea where all that hair came from. But I had to stop clipping because poor Betsy was beginning to resemble one of those old Shetland ponies I sometimes see that have been "body shaved" by an unsupervised child using a rusty pair of dull clippers. Fortunately, Betsy is not a barn dog. She's been afraid of horses her entire life, so she's just a house pet. Which is good, because I'm quite certain Wally would be laughing his head off at her new appearance. Since I won't allow myself to get bored, I'll have to devise other Things to do Inside when it's Too Hot to Ride. Now that I have the clippers out and warmed up, perhaps I should inspect my husband when he gets home. Hmmm... I wonder if he needs a haircut? Click on "comments" below to share your thoughts and your hot weather ideas! I'm already getting nervous. A week from today-- next Wednesday-- I'm having surgery to temporarily attach a new lead to my implanted nerve stimulator. If it successfully controls most of the residual pain that I feel after I ride or exercise then I'll go back to the hospital in another few weeks and have it permanently "rigged up." I wish this were the sort of good nervousness I used to feel about a week before a horse show, but it is not. I'm sort of dreading the surgery, even though compared to some of the medical stuff I've been through it's a cake walk. It's just that I have a certain routine to my horsey life now and I don't want to have it disrupted, even if ultimately I'll benefit from that disruption. In other words, I just want the pain to magically go away without having to go through the stressful experience of signing into the hospital, wrapping myself up in one of those ridiculous gowns that hide nothing, and hopping onto a gurney. Then there's that dreadful, long, drawn out period of time where the nurse starts the IV and I just lie there, wishing that I was home, trail riding Wally. And the ultimate irony? In order to have a procedure that will (hopefully) result in less pain, I have to first endure the pain that comes from having the procedure performed. But, as always, I'll find some humor in the situation. For example, I'm going to judge a horse show the Sunday after this little trip to the operating room. I happen to like judging, and nothing will keep me away from a chance to spend a day around horses and get paid for it! Yet that means I'll be sitting in the summer heat, with wires coming out of my upper back that are connected to a pocket-sized, battery-operated computer. My doctor said, "Don't worry, you can cover it all up with your clothes." It'll be at least 90 degrees. Precisely how much clothing does he anticipate me wearing that day? I can feel the sweat collecting underneath the white adhesive medical tape right now, and the stitches and staples snagging on my shirt each time I scribble notes on my score sheet. Yet believe it or not, I can laugh at that scenario. Why? Because it's just further evidence that I am, indeed, horse crazy. 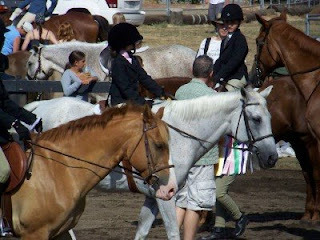 I spent today judging a county-rated hunter and equitation horse show near San Diego. I've worked for this show management team before. They run a very structured yet fun show, with a relaxed, friendly atmosphere. That translates into me being able to wear a polo shirt, nice jeans and loafers while playing the role of Judge. Never mind that I nearly fell backwards down the stairs trying to take this panoramic view from behind my little window seat... 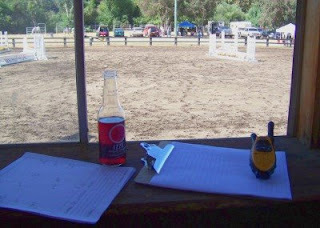 But that's my clipboard with my score sheet on the right and the stack of the day's jumping courses on the left. The orange walkie-talkie actually worked really well today. I could hear the backgate guy 100% of the time, which is nice. As a rider entered the arena, he'd tell me her number and which round she was riding. That prevents me from leaning out the two-story window like Rapunzel, craning my neck to determine the rider's number while she zooms past me on her way to a jump. And-- product placement!-- that's my bottle of "Izzie" carbonated fruit juice. I'm trying to go cold turkey on Coca-Cola this summer. A hopeless endeavor, I'm sure, but at least I made it through the horse show without any caffeinated soda. Ah, there's nothing quite like the melee at the backgate as kids going out of the arena try to grab their ribbons while kids coming in the arena try to jockey for a place on the rail. That's the show manager-- the guy who will pay me at the end of the day-- trying hard not to get trampled. At this moment I'm nervously hoping that if he is indeed maimed, he's still able to put pen to check. 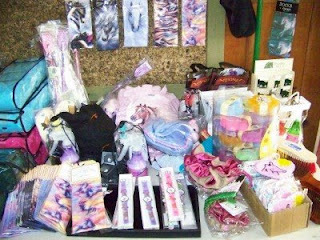 Since this show is aimed at young and novice riders, the show management team offers an assortment of really cute, useful items that appeal to horse crazy girls of ALL AGES. I couldn't help coveting half the stuff: the pony t-shirts, the boot socks with pony motifs, the beaded coin purses with pony faces on them, funky little wristwatches with pony logos on the dial, pony-sized grooming items... Are you getting the idea that I was a little miffed that when I was showing, most of the time I won incredibly useless things like brass keyfobs? Or shot glasses? No horse show scene would be complete without the catering truck. 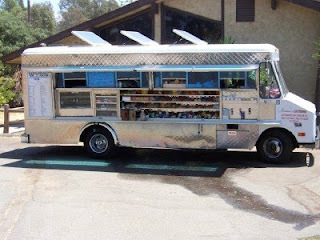 In my mind it's a cruise ship of culinary calamity on wheels. Regardless of how cordial the people are who operate these things, or how clean they appear to be or how tempting their food tastes or smells, I. Just. Stay. Away. Everyone else on the show staff-- from ring crew to announcer-- made use of their Free Food allowance. I, on the other hand, did not. I always view a judging assignment as the perfect opportunity to fast for the day. Why? Sometime I'll write about my Near Brushes With Death Due to Consuming Horse Show Food. In the meantime, just allow your imagination to ponder that scenario, and I'll keep sipping on my bubbly fruit juice. I heard from my friend Wendy today. We attended junior high and high school together. Both of us were horse crazed girls. Then she moved to Idaho, got married and now lives on a small ranch that looks like it belongs on the cover of a greeting card. Anyway, she related in her email how the weather seemed so hot when she was trail riding. It was a whopping 80 degrees. Just to show the disparity between our climates, 80 degrees is mild weather for us. It barely calls for sunscreen! Now, 90-95 degrees... that's getting hot for trail riding. And that's what it's been like by midday out here. So I hustled outside early this morning before the sweat could began to slither down the middle of my back. I gave Wally a good longe down in the arena behind my house, sponged him off (in an effort to help him be more comfy) and then tacked him up and rode around the neighborhood for about 30 minutes. I'm so happy that he seems fully recovered from his odd bout of soreness last Sunday. I spoke again with Jennifer, my vet, and she really thinks that it's not a classic stifle problem, but perhaps something to do with a nerve being occasionally pinched or irritated. She compared it to over-exerting yourself, then plopping down on the sofa. And then, if you suddenly stand up, you feel a horrible pain or cramp so that you can hardly walk for a few minutes. Since it has only happened 3 times in a year and a half, and Wally recovers rapidly with no after effects, I think I'll refrain from spending $1,000 or more on a fishing expedition trying to pinpoint the cause of the transitory problem. Obviously, if it becomes something more chronic then I'll be coughing up the cash. Let's all have a moment of silence in hopes that it doesn't come to that. In the meantime, Wally is still on a diet. Color him Not Happy with Me. Then again, I've also decided that I'm perfectly fine with him being what I refer to as a "ladies recreational pleasure riding horse." In other words, he can just be a part-time trail horse/part-time arena horse/full-time backyard pet. After all, it's not like I'm free of any medical restrictions. Perhaps Wally and I both have to learn to live with our limitations. By the way, I'm having another surgery on August 13. But that's a topic for another blog. Meanwhile, I'm judging a horse show near San Diego on Sunday. Wish me well. I'm hoping it'll only be about 80 degrees down there. You know, like it is in Idaho. Post your ideas and responses by clicking on "comments" below.